Newspaperofrecord (IRE) left no doubters Friday as she left a formidable European field behind in the stretch of the Grade 1 Breeders' Cup Juvenile Fillies Turf on Friday. After taking command going into the first turn, jockey Irad Ortiz never looked back, keeping the filly well in hand into the top of the stretch and provided minimal encouragement to put her clear by 6 3/4 lengths at the wire. The win is the fourth in the last five years for trainer Chad Brown, who won previous editions of the race with Rushing Fall, New Money Honey, and Lady Eli. Newspaperofrecord came to the race after a similarly-commanding win in the G2 Miss Grillo at Belmont in late September. Brown trains the daughter of Lope de Vega (IRE) for Seth Klarman's Klaravich Stables. The win is the first Breeders' Cup victory for Klaravich Stables. Newspaperofrecord was bred in Ireland by Times of Wigan Ltd. and is out of Holy Roman Emperor (IRE) mare Sunday Times (GB). She was purchased at Tattersalls October last year by Klaravich for $278,019. She was offered by Goldford Stud. “I know everyone is going to be asking about the Coronation at Ascot, and I've had some really good fillies before, namely Lady Eli and Rushing Fall would have been good candidates for that — but in the end, I didn't feel it was right for those two horses for whatever reason,” Brown said. “This filly is pretty unique. She has good speed from the gate. She handles soft ground. The weather won't be an issue. She's very, very sound. She has a good head on her. East (GB) prevailed by a neck over Stellar Agent in a photo for second. The final time for the mile on the turf was 1:39.00. Newspaperofrecord paid $3.20 to win. After heavy rains Wednesday and Thursday, the turf course was listed as yielding at the time of the race. 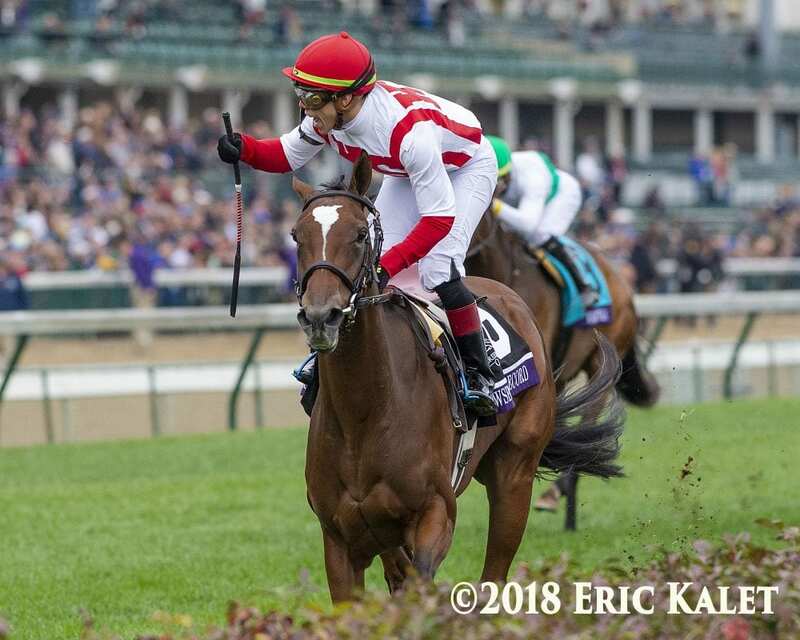 This entry was posted in Breeders' Cup, NL Article and tagged 2018 breeders' cup, Breeders' Cup Juvenile Fillies Turf, Chad Brown, Irad Ortiz, Klaravich Stables, lope de vega, newspaperofrecord, Tattersalls October by Natalie Voss. Bookmark the permalink.